George Alexander Pearre (1860-1923), a Republican, was born in Cumberland and attended the Allegany County Academy. He was elected to and served in the Maryland State Senate from 1890-1892, and in 1898 was elected to represent Maryland’s Sixth Congressional District in the U.S. House of Representatives. Pearre was re-elected five times and served from 1899-1911. He chose not to run for re-election in the 1910 election campaign. George Louis Wellington (1852-1927), a Republican, was born in Cumberland, Maryland. Wellington served in the U.S. House of Representatives from Maryland's Sixth Congressional District from 1895 to 1897. He was elected to the U.S. Senate in 1896, and served from 1897 through 1903. He did not seek reelection. In 1913 Wellington unsuccessfully sought election to the U.S. Senate on the Progressive Party ticket. The Wellington item portrayed here is not a button. It is a "stud", and was designed with a metal shank to be worn through a buttonhole on the lapel. It should be noted that this item might have been used in either his Senatorial or Congressional campaigns, or both. David John Lewis (1869-1952), a Democrat, was born in Pennsylvania but spent most of his life in Allegany County, Maryland. A coal miner and lawyer by profession, Lewis served in the Maryland State Senate from 1902 to 1906. He ran unsuccessfully for the House of Representatives in 1908, but was later successful in the 1910 election and served in the U.S. House of Representatives from 1911 through 1917, and again from 1931 to 1939. "Davey" Lewis was defeated in the Senatorial campaign of 1916 by Joseph I. France, a Republican. He unsuccessfully sought the Democratic Party's nomination for Senate in 1922, and again in 1938. As we do not have an item from any of his campaigns for the House of Representatives, we have depicted one of his Senate race buttons so he can be included in this website. Frederick Nicholas Zihlman (1879-1935), a Republican, was born in Pennsylvania but moved to Cumberland in 1882 with his parents. Although unsuccessful in his 1914 election bid to the U.S. House of Representatives, he was later successful in 1916 and following six successful re-election efforts would go onto represent Allegany County in Congress from 1917 through 1931. He had lost his attempt for re-election in the 1930 election, and was again unsuccessful in a 1934 bid. Stephen DeWitt Hyde (1909-1986), a Republican, was born in Washington, DC. He served in the Maryland House of Delegates, representing Montgomery County, from 1947-1950, and as a member of the Maryland State Senate, representing Montgomery County, from 1951-1952. It was in 1952 that Hyde was elected to represent Maryland’s Sixth Congressional District where he served from 1953-1959. Though re-elected in 1954, Hyde was unsuccessful in his 1958 re-election bid to the Congress. Walter Perry Johnson (1887-1946), a Republican, served as a Commissioner on the Montgomery County Council. In 1940 he unsuccessfully sought the Sixth Congressional District seat against the Democrat, William Devereux Byron. Although Johnson lost, he received 52,258 votes, or 47%, to Byron's 60,037 votes, or 53%. Walter P. Johnson was a professional baseball pitcher with the Washington Senators from 1907-1927, his final year as a player. He won 417 games and from 1921 to 1983 held the major league record for strike-outs (3508). Walter P. Johnson, sometimes referred to as "The Big Train", was inducted into the Baseball Hall of Fame in 1936. Walter Johnson High School in Bethesda is named after him. It is also worthwhile noting that he pitched in the 1910 baseball game at which William Howard Taft became the first President to attend an Opening Day for baseball. Charles McCurdy Mathias, Jr. (1922-2010), a Republican, served in the Maryland House of Delegates from 1959 to 1960, and was elected to the U.S. House of Representatives in 1960, and re-elected again in 1962, 1964 and 1966 eventually serving from 1961 through 1969. 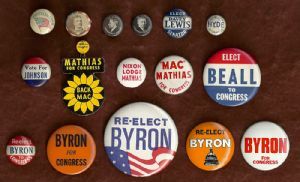 A button from his 1960 campaign, featuring Richard Nixon and Henry Cabot Lodge at the top of the ticket for President and Vice-President, respectively, is featured. Nixon and Lodge lost. In 1968, Mathias was elected to the U.S. Senate and served as a Senator from 1969 through 1987. Charles "Mac" Mathias chose not to run for reelection in the 1986 Senatorial campaign. John Glenn Beall, Jr. (1927-2006), was elected to the U.S. Congress, representing Maryland's Sixth Congressional District, serving from 1969 to 1971. J. Glenn Beall, Jr. was then elected to the U.S. Senate in the 1970 election, and served in the Senate from 1971 to 1977. Beall received 484,960 votes, or 50.71% of the total votes cast, in his 1970 Senate win and defeat of Joseph D. Tydings, the Democratic candidate. William Devereux Byron (1985-1941), a Democrat, was born in Virginia and moved to Williamsport, Maryland with his family in 1899. Byron served as Mayor of Williamsport from 1926-1930 and as a member of the Maryland State Senate from 1930-1934. In 1938 he was elected to the U.S. House of Representatives and served in that capacity from 1939 until his death in an airplane crash in 1941. Katherine Edgar Byron (1903-1976), a Democrat, served as a Williamsport Town Commissioner from 1938-1940. Upon the death of her husband, William Devereux Byron, in 1941, she was elected via a Special Election to fill the Congressional seat of her husband. Katherine Byron served from 1941-1943. She did not run for re-election in the 1942 election campaign. Goodloe Edgar Byron (1929-1978), a Democrat, was the son of William and Katherine Byron. Goodloe Byron served in the Maryland House of Delegates from 1963-1967, and the Maryland State Senate from 1967-1971. In 1970 Byron was elected to represent Maryland’s Sixth Congressional District in the U.S. House of Representatives. He was re-elected in 1972, 1974, and again in 1976 and would serve in this capacity from 1971 until his death in 1978. Beverly Barton Butcher Byron (1932- ), a Democrat, was in 1978 elected to succeed her late husband, Goodloe E. Byron, to the U.S. House of Representatives representing Maryland’s Sixth Congressional District. She was re-elected six times eventually serving from 1979 to 1993. Byron was unsuccessful in gaining her party’s nomination in the 1992 Democratic Primary.